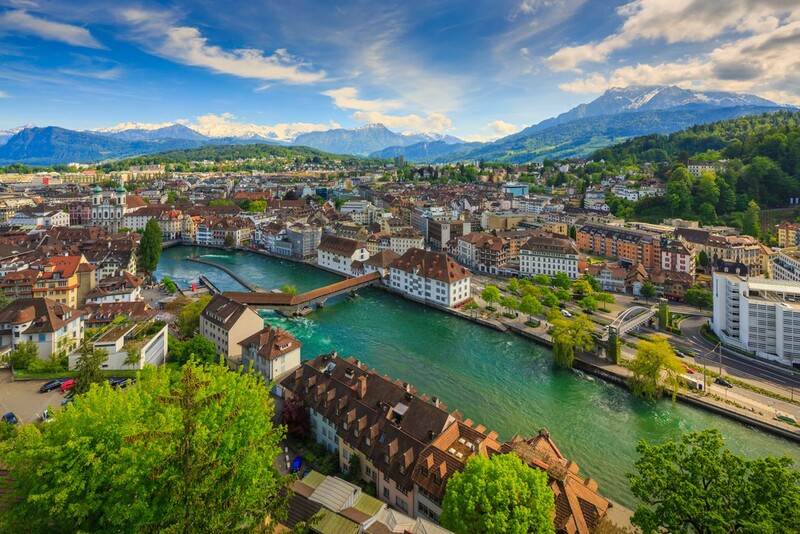 LUCERNE: Walking tour including the Lion Monument and Chapel Bridge; [LF] private cruise with a drink and farewell dinner at a local restaurant, Headsets throughout the tour. First-Class: An elegant 309 room hotel, dedicated to Prince Eugene of Savoy and housed in the former State Austrian Printing House with a modern, glassy atrium. Amenities include a fitness area, sauna and steam room, two restaurants and a jazzy bar. 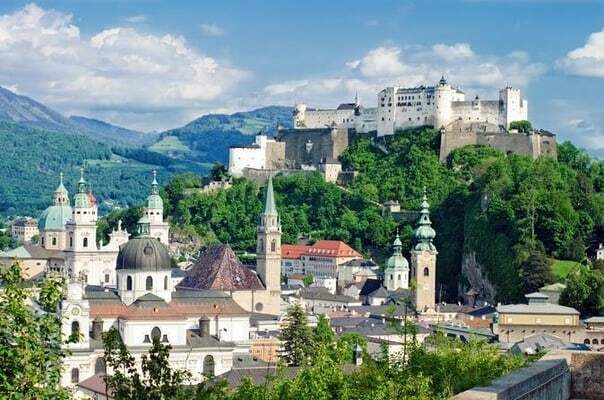 Superior First-Class: Located in center of Salzburg, walking distance to Mirabell Gardens and Mirabell Palace - 15 minutes to WA Mozart Airport. First-Class: Traditional mountain architecture with lots of woodworks & local grisons style; in center of St Moritz-Bad; near spa & ski slopes. First-Class: Chalet style hotel with modern comforts and amenities, restaurant, sauna and solarium; located near the Gornergrat station. First-Class: Enjoy a Great Location at the Westside Shopping and Leisure Centre when you Book the Holiday Inn Bern-Westside Hotel. This chocolate-themed hotel is only 200 meters away from the Toblerone factory and is linked to Daniel Libeskind's Westside Centre, putting a wide range of shops and restaurants at your doorstep. First-Class: A classical 19th century 169 room property. This hotel offers a wonderful contrast of old charm with modern interior design and has a beautiful garden to enhance your stay. Wi-Fi access is available throughout the hotel with a fee (payable locally). The main dining room is opulently decorated serving traditional Swiss dishes and there is also a lounge and terrace area with a bar service. Superior First-Class: Hotel with contemporary design features throughout, 2 kms from Zurich Airport and 10 kms from Zurich city center. 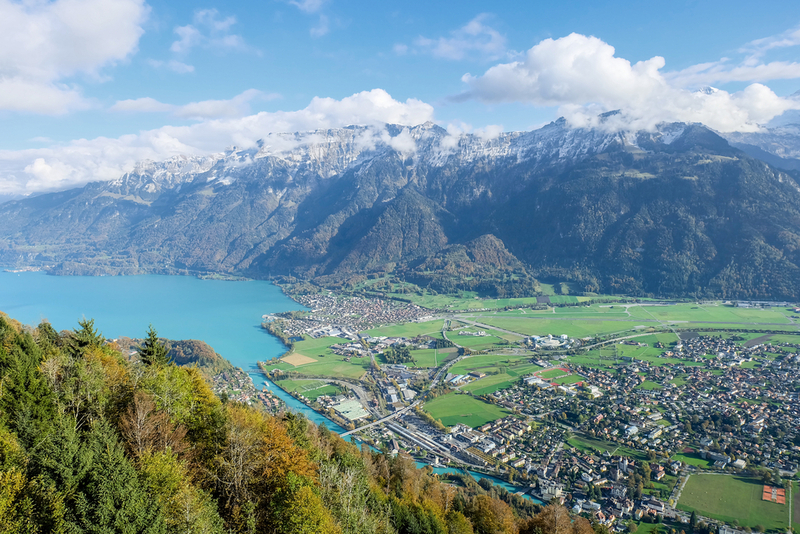 This escorted tour of the Best of Austria & Switzerland covers the highlights of two of Europe's most scenic countries: Austria and Switzerland. You'll spend two nights each in Vienna, Salzburg, Zermatt, and Lucerne, and an overnight in St. Moritz and Berne. If you're a fan of palaces and castles, you'll enjoy a visit to Vienna’s Schönbrunn Palace, once the home of the Habsburg Imperial family. Stand in awe as you hear the stories of this royal family's home. You'll also enjoy a visit to romantic Chillon Castle, a well-preserved, medieval castle on the shores of Lake Geneva. If spectacular scenery is your interest, then you'll be thrilled with the ride on the world-famous Glacier Express train, where you'll travel first-class and have panorama windows to admire the thundering waterfalls, impressive peaks, glacial ice fields, and tiny villages on your way to Zermatt, a picturesque cluster of rustic chalets beneath the majestic Matterhorn. Other scenic highlights include a Danube cruise along the prettiest part of the river; a private boat cruise on the fjord-lake in Lucerne; a mountain train ride from Zermatt to Täsch; a scenic drive into the Swiss Engadine, considered by many to be the most beautiful mountain area in the world; a drive in the Tyrolean Alps on the way to Innsbruck; a stop in Interlaken, where you can take pictures of the Jungfrau Massif. These are just a few of the many highlights of this Austria & Switzerland guided tour. You'll also enjoy guided sightseeing in Vienna, Salzburg, and Berne. From the historic sites, castles, and palaces to the spectacular scenery, this is a dream vacation! Welcome to Vienna! At 6 pm, meet your Tour Director and traveling companions for a special welcome dinner with wine at your hotel. 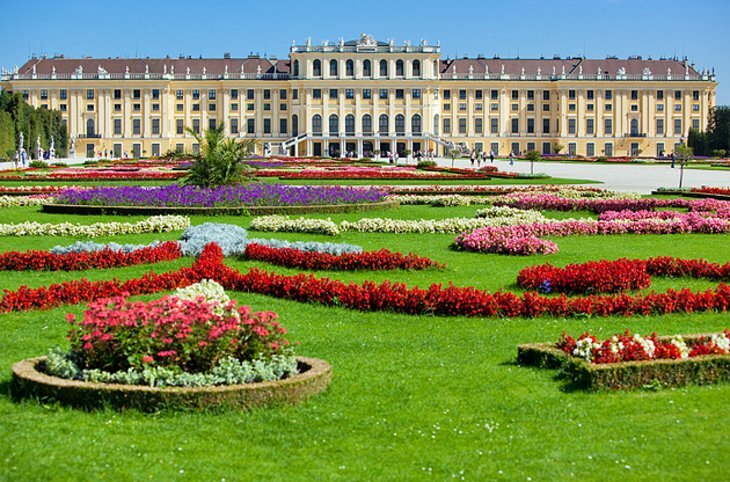 Start your guided sightseeing with a visit to magnificent SCHÖNBRUNN PALACE. 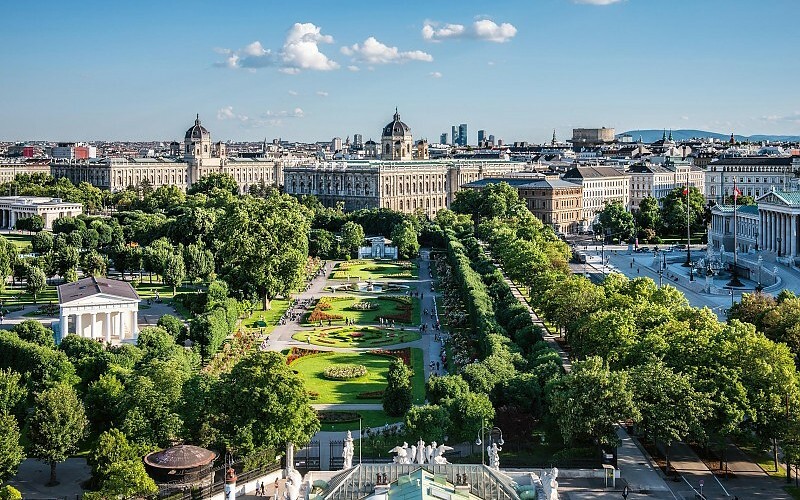 Then, drive along the Ringstrasse, pass the State Opera House, the Jewish quarter, and stop at the Hofburg Palace, winter residence of the Austrian imperial family. Marvel at the impressive courtyards, famous HELDENPLATZ, and awesome St. Stephen’s Cathedral. Balance of the day is at leisure and you can choose from our exciting optional excursions to enhance your stay. Enjoy a leisurely DANUBE CRUISE along the prettiest part of the river. Afterwards, catch glimpses of historic Melk Abbey, and continue through the romantic Salzkammergut lakeland, made famous in The Sound of Music movie. Stop in Mondsee to visit the PARISH CHURCH, which was used for the wedding scenes, and continue to Salzburg. During your guided walking tour admire exquisite MIRABELL GARDENS, the Great Festival Hall, St. Peter’s Monastery, and magnificent RESIDENZ SQUARE, where some scenes of The Sound of Music movie were filmed. Also take pictures of Mozart’s birthplace in the charming Getreidegasse. A special dinner and Salzburger Nockerl (sweet dessert soufflé) has been prepared for you at the famous St. Peter Stiftskeller restaurant. 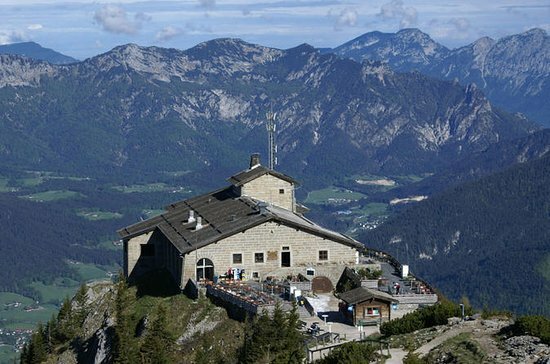 Today is your chance to join an optional excursion to spectacular Berchtesgaden and Hitler’s Eagles Nest. Enter the Tyrolean Alps and stop in the capital of crystal, Innsbruck. Enjoy a pleasant walk through its quaint medieval lanes to Emperor Maximilian’s GOLDEN ROOF. 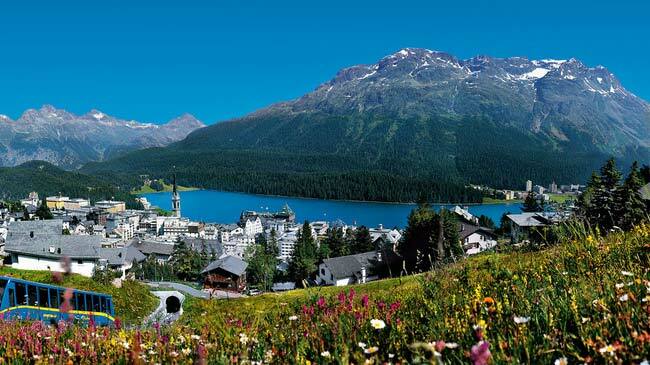 Next, a scenic drive into the Swiss Engadine, considered by many as the most beautiful mountain area in the world with its deep-blue lakes, airy larch forests that turn golden in the fall, mountain peaks exceeding 12,000 feet, and quaint villages with massive white stone houses in the characteristic Grisons style. The rest of the day is at leisure in ritzy St. Moritz. Drive through exhilarating Alpine scenery. 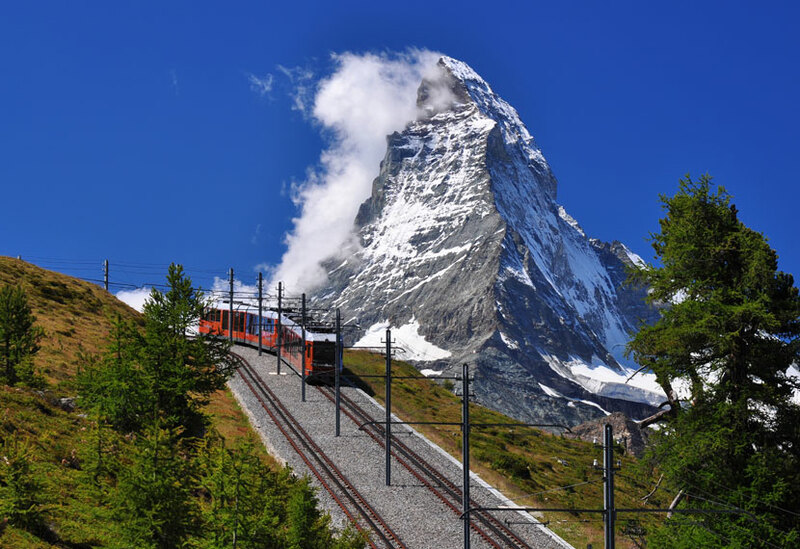 At Chur, board the first-class panoramic coach of the world-famous GLACIER EXPRESS TRAIN, which connects two of Switzerland’s most famous skiing areas: St. Moritz and Zermatt. Enjoy your first-class ride with panorama windows and admire thundering waterfalls, impressive peaks, glacial ice fields, and tiny villages as you pass through the Valais, a region known for its great mountain resorts and excellent wines. Lunch will be served on the train. This afternoon you are in Zermatt, a picturesque cluster of rustic chalets beneath the majestic Matterhorn. Board the MOUNTAIN TRAIN to Täsch and motor through the lower Rhône Valley to the shores of Lake Geneva. Here, enjoy a highlight visit to CHILLON CASTLE, the 12th-century water fortress immortalized by poet Lord Byron. Arrive in Berne for your overnight stay. Your guided tour starts with a stop at the Rose Garden for a panoramic view of the city. Walk through the beautifully preserved medieval Old Town, witness the hourly parade of painted figures at the Clock Tower and marvel at the ornate, flower-adorned fountains. Stop at the BEAR PARK, symbol for the name of the town. Next is Interlaken, where you can take pictures of the towering Jungfrau, then continue across Brünig Pass to picturesque Lucerne. An optional evening is available to a folklore party with yodeling and alphorn blowing for a first-hand impression of Alpine merrymaking. On your walking tour this morning, admire Thorwaldsen’s impressive LION MONUMENT, dedicated to the fallen Swiss Guards who protected the Royal House of France during the French Revolution, and ornate patrician houses of the walled Old Town. Then, cross the famous covered CHAPEL BRIDGE to the Jesuit church. Afterwards, shop for watches, and you may wish to join an optional excursion to Mount Pilatus. This evening, enjoy a PRIVATE BOAT CRUISE on the fjord-like lake, followed by a farewell dinner at a local restaurant to celebrate the success of your Swiss vacation. Morning transfer to Zurich Airport in time for homebound flights leaving no earlier than 10 am. Extra nights are available in Zurich, not Lucerne.